What are they talking about? Litter! Sadly litter has always been with us, but perhaps never so much as in present days. We live in a throw-away society. 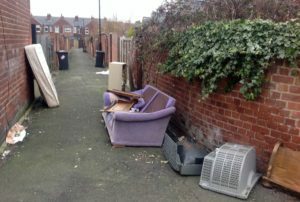 It can be seen in our streets and back alleys here in Hexthorpe. See the photographs in the present issue of the Hexpress. However, we want to highlight good news – local people, including our youngsters, are determined that the situation can change. There is news of three different groups who have voluntarily taken on the task of helping to make our streets, backs and park free from litter.